I don’t know about you, but I’ve had a blast this last month here on the blog, there seems to have been so much stuff to talk about, it has been really great to talk about all the upcoming stuff, the current projects, theory-craft about the future and so on. It’s been really productive for me, and hitting that 800-post milestone was just the icing on the cake there. I published a new blog every day for the week in which post 800 arrived, though looking at the little calendar over on the right there, I actually posted for nine consecutive days, which is definitely more productive than I’ve been for a long time here! Which is interesting to me, as I love a good stat. However, the month is now at an end, and so I thought I’d ramble instead about the upcoming projects that I have on the horizon, and see where I’d like to be at the end of the year – it’s something I have thought about lately, and as we launch ourselves at December this weekend, I think it’s about time to lay out some groundwork! This month, I’ve managed to paint quite a lot, as it happens, between the Thorns of the Briar Queen warband, the Fulgurite Electro-Priests that I’ve been wanting to paint since they came out, and the recent batch of Necrons and Dark Eldar chaps. Starting work on the Elucidian Starstriders has, I feel, knocked me a little as I had been trying to focus instead on painting just one unit and getting that finished. It was fine when I could focus just on the Electro-Priests, or just on the Immortals, but I do feel that I have once more been branching off and, sadly, it’s no good to anyone! I’ve recently been feeling really annoyed at having so many partly-painted miniatures out on the desk, so I think I need to pare things down and just work on the unit I want to finish, then move on. Which brings me on to the units that I want to work on! 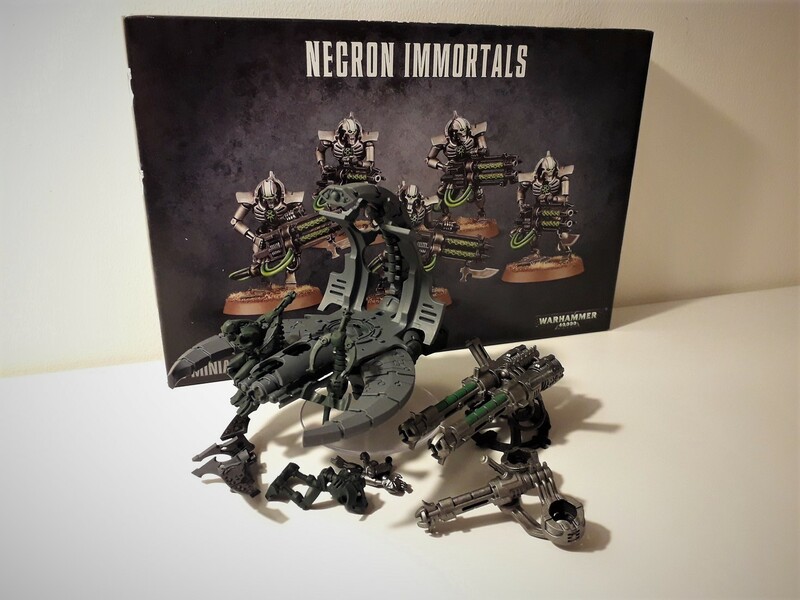 I had been talking earlier in the month about Necrons first and foremost, and wanted to paint up some more Immortals and some Deathmarks. Well, I have finished the unit of Deathmarks now, so I think I will indeed go for the heavy armour and add the Annihilation Barge to that list, alongside some more Immortals. For the Great Reanimation project, I currently only have 15 troops painted, while my list requires 25, so I think I need to get moving there. I have, actually, nearly caved on a couple of occasions and bought some Warriors for the army – sculpts that I dislike so much, but I can see myself perhaps eventually adding in the new year. Never thought I’d see the day, but there we are! I’m still considering it, though, so haven’t pulled the trigger yet. We shall see. I’m hoping that the fact the Annihilation Barge is partly painted already will give me a good head-start on this! Before I move on, I thought I’d just mention my Dark Eldar, and the fact that I’ve recently managed to finish off a couple of things that have been hanging around the painting table for a while now, such as a Venom and the Sslyth. I’m quite chuffed that I’ve finally painted up a full Court of the Archon, which looks so gloriously weird that I love it! I’ve enjoyed getting these final few projects completed, to try and fully round-out the army, and have been trying to get more of the special-weapon Kabalites painted up as well. I now have the grand total of two splinter cannons and two shredders in the army – yes, that is apparently all! It’s surprising, really, that I’ve otherwise managed to get a silly amount of dark lances and blasters, when I try my hardest not to listen to the internet meta and go for these things! But there we are. I’ll probably continue to paint up odd warriors like this – I think I have at least three squads built and primed, so I suppose it’s inevitable that some of those will find their way to the table eventually. I wanted to experiment with taking huge blobs of Kabalite Warriors without relying on Raiders, so using 20-man blobs that include a dark lance, a splinter cannon, two shredders and two blasters (the max load-out). Not sure if that would be any use, as it would be a huge points-sink (200 points, without kitting out the Sybarite with any special weapons). At any rate, I have no plans to paint anything further for the army this year, though that could change as I decide to try something new! Let’s talk about Skitarii, though. I’ve been thinking about getting back into Kill Team with a force of the robot-men, and have been reading some short stories/novellas that feature them, so it’s probably natural that my attention would be turned that way. I’ve now got a grand total of 10 models painted for the AdMech army that I’ve been thinking about for years, so I think it’s time to really try and add some more to that. I’ve mentioned recently wanting to add in either some Rangers or Vanguard (probably Vanguard), and the Tech Priest Dominus, and while I think that’s definitely the goal, I don’t know if I’ll manage to get them all finished in December. The Tech Priest is such an amazing kit that I really want to try to do it justice, and so would need to spend a lot of time with it, picking out all the details of cabling and such. I’m fairly confident I can get some troops rattled off fairly quickly, though, so fingers crossed they won’t be too much bother. I recently built up some Vanguard with a lot of special weapons in the team, so I may actually try and get those painted as well, but for now I’m sticking to just five regular dudes with radium carbines. Let’s talk about Chaos for a bit! 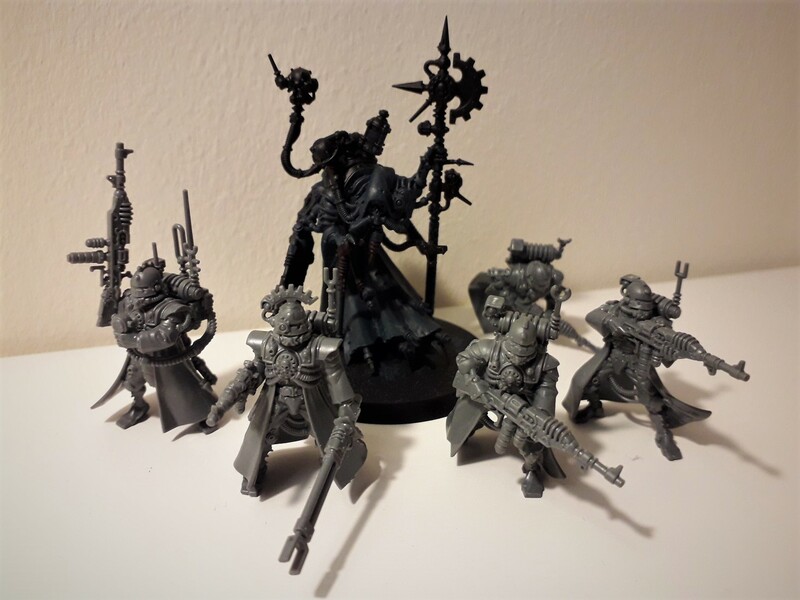 Blackstone Fortress has inspired me so much as regards getting into the Ruinous Powers, but my thoughts had turned from the Light of the Emperor with the Necromunda rules for Chaos Cults. I’ve currently got a bunch of these guys built up ready, having found my Dark Vengeance stuff as well as picking up some more off ebay, so I’m ready to get moving there. I currently have just five miniatures plus the gang leader (I think he was called Tetchvar in Dark Vengeance?) primed and ready, so I’m looking forward to getting round to those. I’d like to spend some quality time painting these guys, as well, as I think the miniatures look fantastic, and there is an element of wanting to do the models justice given the fact they are so scarce now! However, Blackstone Fortress is also a thing, and I’m thinking about adding some of those miniatures to the fray, also. 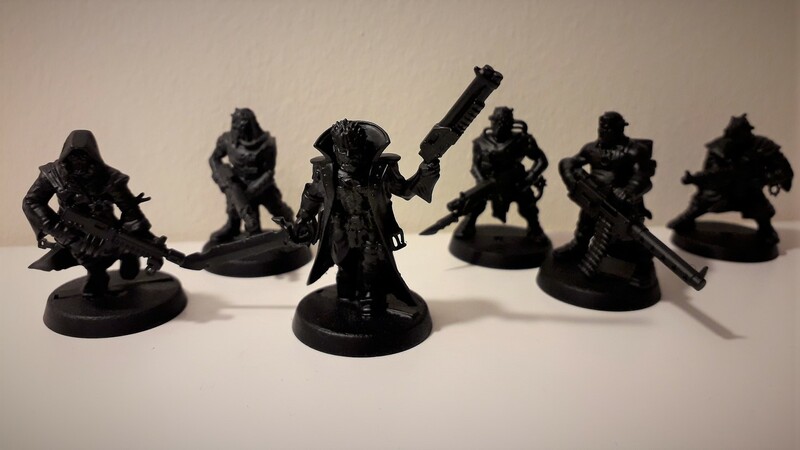 I’ve bought additional Rogue Psykers, as I thought it would be a good model to use as the Cult Witch in Necromunda when I get round to that, so I might add those to the roster. Some guys in my local group have also started on the Traitor Guard, and their results are amazing, but the feedback is they’re so detailed models that it’s taking longer than expected to paint them. So I might not move on to them just yet, as I’m trying to go easy on myself here!! Between everything, I think there should be some excellent fodder for my budding Chaos warband. I think the sensible thing to do would be to re-evaluate the situation once I’ve gotten going with my painting projects during the month. So for now, we’ll just stick to the Chaos Cultist models and see about adding in Traitor Guard later. Now then, let’s bring ourselves back from the brink and return fully to the Light of the Emperor, with some Space Marines! I’ve talked recently about two of my favourite projects from back in the day, Deathwing and Deathwatch, and I am quite keen to do some Imperium projects alongside all the Xenos and Heretic stuff I have going on! I had been thinking about trying to finish the Deathwing Knights, which have been hanging about half-finished for years, but I’m already feeling a little overwhelmed at this point, that I’m moving away from this idea a little bit. Similarly, I’d thought about trying to paint up some characters for the Deathwatch, but again, it feels like those models would require too much time to do them proper justice. So I’m thinking that I’d prefer to hold back a little, and see how the month pans out before going too crazy here. I’ve got almost twenty models that I want to get painted during December, already, so I don’t want to just keep adding to the list and risk not getting anything done! But I shall definitely re-evaluate the situation once the month is underway! This blog is already running quite long, but you’ll be pleased to learn that I’m not far from done now! Now that I’ve outlined all of the stuff that I would like to get painted during the month, I thought I’d waffle a bit more about my thoughts for getting it done in time. I’ve really enjoyed the focus I’ve been able to maintain on the hobby during November, and I was talking about this sort of thing with my mother-in-law at the weekend, who is herself a very crafty person, doing all sorts of sewing stuff. Anyway! She was saying that she’s taking part in some kind of long-term thing whereby you commit to doing a little crafting each day for 50 days (at least, I think it was 50 days), and it has really helped her to get some projects moving along. So I’m planning to adopt this approach myself, and so every day during December, I’m intending to paint for at least an hour a day. I think that a lot of my success during November has been due to painting miniatures as a wind-down before bed (though it hasn’t helped my sleeping much, given that I’ve been excited about getting projects moving!) So I’m hoping to continue that, and while I suppose I can probably write-off Christmas Day due to the usual family commitments, who knows if I may well still manage a few brush strokes?! I do have some time off though, so can always make up for lost time! I think this approach of ‘a little, often’ should do quite well, and if I can keep the focus on getting units finished at a time, I should be fine! That’s the theory, at any rate!! I’ll be documenting my progress over at my instagram account, with daily updates of what I’ve done (hopefully I’ll stick to this list, but you never know!) and, every Sunday, I’ll be reinstating the Hobby Progress blogs for the month, with a special one on New Year’s Eve that showcases all of the stuff that I’ve managed to paint throughout the course of the year. It’s surprisingly more than I had thought!! So stay tuned for all of this and more, as we throw ourselves at December! Very good choice for the Kabal of the Obsidian Rose! That is my choice Kabal too :D. Love all the work you are doing, keep it up! Pingback: Hobby Progress, week one!